Hej med jer. 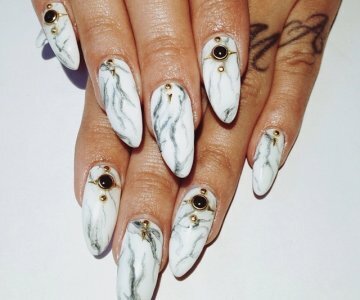 Nu fik jeg forsøgt mig med marmor nail art. Jeg er helt vildt glad for resultatet! Først lakerede jeg alle neglene hvide. Herefter brugte jeg sort og guld glitter til marmor effekten. Den hvide lak er Essie – Blanc, den sorte er Depend 7day Hybrid polish – 7013 Goth Black og guld glimmerlakken er OPI – My favorite ornament. 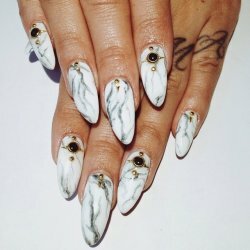 Hi :) I tried out stone marble nail art and I love it. It takes a bit of time (especially the clean-up) but it is worth it. At first I painted all my nails white. I the used black and white to create the marble effect. Using a drop of polish in room-temperature water, the polish will spread in a thin layer. I then spray the thin layer of polish with an alcohol-based product (I used a beachwave spray), and the polish will seperate in the beautiful patterns. I dip a nail in the pattern, use a toothpick to collect the excess polish and lift my finger from the water. I do this with each nail – first the black polish, then the gold glitterpolish. The white polish is Essie – Blanc, the black is Depend 7day Hybrid polish – 7013 Goth Black and the gold glitterpolish is OPI – My favorite ornament.